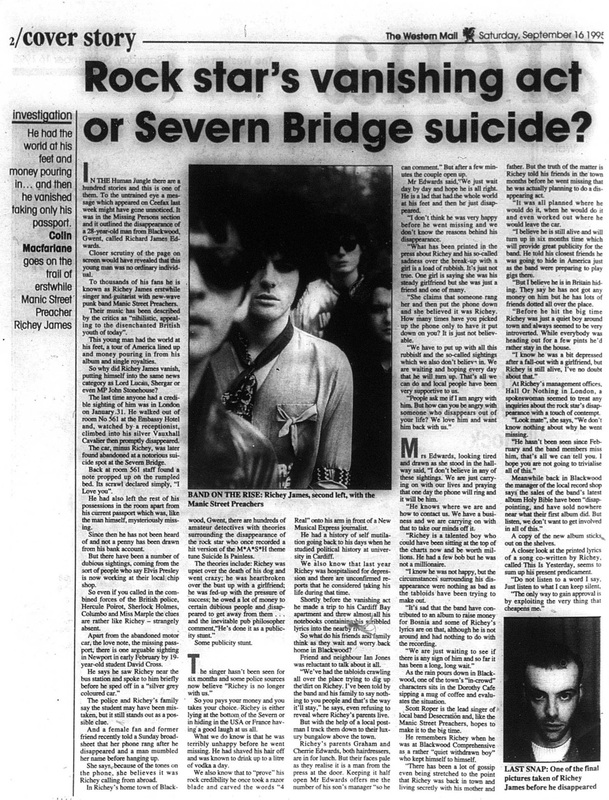 Title: Rock Star's Vanishing Act Or Severn Bridge Suicide? In the Human Jungle there are a hundred stories and this is one of them. To the untrained eye a message which appeared on Ceefax last week might have gone unnoticed. It was in the Missing Persons section and it outlined the disappearance of a 28-year old man from Blackwood, Gwent, called Richard James Edwards. Closer scrutiny of the page on screen would have revealed that this young man was no ordinary individual. To thousands of his fans he is known as Richey James erstwhile singer and guitarist with new-wave punk band Manic Street Preachers. Their music has been described by the critics as "nihilistic, appealing to the disenchanted British youth of today". This young man has the world at his feet, a tour of America lined up and money pouring in from his album and single royalties. So why did Richey James vanish, putting himself into the same news category as Lord Lucan, Shergar or even MP John Stonehouse? The last time anyone had a credible sighting of him was in London on January 31. He walked out of room 561 at the Embassy Hotel and, watched by a receptionist, climbed into his silver Vauxhall Cavalier then promptly disappeared. The car, minus Richey, was later found abandoned at a notorious suicide at the Severn Bridge. Back at room 561 staff found a note propped up on the rumpled bed. Its scrawl declared simply, "I love you". He had also left the rest of his possessions in the room apart from his current passport which was, like the man himself, mysteriously missing. Since then he has not been heard of and not a penny has been drawn from his bank account. But there have been a number of dubious sightings, coming from the sort of people who say Elvis Presley is now working at their local chip shop. So even if you called in the combined forces of the British police, Hercule Poirot, Sherlock Holmes, Columbo and Miss Marple the clues are rather like Richey - strangely absent. Apart from the abandoned motor car, the love note, the missing passport, there is one arguable sighting in Newport in early February by 19-year-old student David Cross. He says he saw Richey near the bus station and spoke to him briefly before he sped off in a "silver-grey coloured car." The police and Richey's family say the student may have been mistaken, but it still stands out as a possible clue. And a female fan and former friend recently told a Sunday broadsheet that her phone rang after he disappeared and a man mumbled her name before hanging up. She says, because of the tones on the phone, she believes it was Richey calling from abroad. In Richey's home town of Blackwood, Gwent, there are hundreds of amateur detectives with theories surrounding the disappearance of the rock star who one recorded a hit version of the M*A*S*H theme tune, Suicide Is Painless. The singer hasn't been seen for six months and some police sources now believe 'Richey is no longer with us'. So you pays your money and you takes your choice, Richey is either lying at the bottom of the Severn or in hiding in the USA or France having a good laugh at us all. What we do know is that he was terribly unhappy before he went missing. He had shaved his hair off and was known to drink up to a litre of vodka a day. We also know that to 'prove' his rock-credibility he once took a razor blade and carved the words "4 Real" into his arm in front of a New Musical Express journalist. He has a history of self-mutilation going back to his days when he studied political history at university in Cardiff. We also know that last year Richey was hospitalised for depression and there are unconfirmed reports that he considered taking his life during that time. Shortly before the vanishing act he made a trip to his Cardiff Bay apartment and threw almost all his notebooks containing his scribbled lyrics into the nearby river. So what do his friends and family think as they wait and worry back home in Blackwood? Friend and neighbour Ian Jones was reluctant to talk about it all. "We've had the tabloids crawling all over the place trying to dig up the dirt on Richey. I've been told by the band and his family to say nothing to you people and that's the way it'll stay," he says, even refusing to reveal where Richey's parents live. But with the help of a local postman I track them down to their luxury bungalow above the town. Richey's parents Graham and Cherrie Edwards, both hairdressers, are in for lunch. But their faces pale as they realise it is a man from the press at the door. Keeping it half open Mr Edwards offers me the number of his son's manager "so he can comment." But after a few minutes the couple open up. Mr Edwards said, "We just wait day by day and hope he is an alright. He is a lad that has the whole world at his feet and then he just disappeared." "What has been printed in the press about Richey and his so-called sadness over the break-up with a girl is a load of rubbish. It's not true. One girl is saying she was his steady girlfriend but she was just a friend and one of many." "She claims that someone rang her and then put the phone down and she believed it was Richey. How many times have you picked up the phone only to have it put down on you? It is just not believable." "We have to put up with all this rubbish and the so-called sightings which we also don't believe in. We are waiting and hoping every day that he will turn up. That's all we can do and local people have been very supportive to us." "People ask me if I am angry with him. But how can you be angry with someone who disappears out of your life? We love him and want him back with us." Mrs Edwards, looking tired and drawn as she stood in the hallway said, "I don't believe in any of these sightings. We are just carrying on with our lives and praying that one day the phone will ring and it will be him." "He knows where we are and how to contact us. We have a business and we are carrying on with that to take our minds off it." "Richey is a talented boy who could have been sitting at the top of the charts now and be worth millions. He had a few bob but he was not a millionaire." "I know he was not happy, but the circumstances surrounding his disappearance were nothing as bad as the tabloids have been trying to make out." "It's sad that the band have contributed to an album to raise money for Bosnia and some of Richey's lyrics are on that, although he is not around and had nothing to with the recording." "We are just waiting to see if there is any sign of him and so far it has been a long, long wait"
As the rain pours down in Blackwood, one of the town's "in-crowd" characters sits in the Dorothy Cafe sipping a mug of coffee evaluates the situation. Scott Roper is the lead singer of local band Desecration and like the Manic Street Preachers hopes to it to big time. He remembers Richey when he was at Comprehensive as a rather "quiet withdrawn boy" who kept himself to himself. "There has been a lot of gossip even being stretched to the point that Richey was back in town and living secretly with his mother and father. But the truth of the matter is Richey told his friends in the town months before he went missing that he was actually planning to do a disappearing act." "It was all planned where he would do it, when he would do it and even worked out where he would leave the car." "I believe he is still alive and will turn up in six months time which will provide great publicity for the band. He told his closest friends he was going to hide in America just as the band were going to play gigs there." "But I believe he is in Britain hiding. They say he has not got any money on him but he has lots of friends dotted all over the place." "Before he hit the big time Richey was just a quiet boy around town and always seemed to be very introverted. While everybody was heading out for a few pints he'd rather stay in the house." "I know he was a bit depressed after a fall-out with a girlfriend, but Richey is still alive, I've no doubt about that." At Richey's management offices, Hall Or Nothing in London, a spokeswoman seemed to treat any inquiries about the rock star's disappearance with a touch of contempt. "Look mate", she says, "We don't know nothing about why he went missing." "He hasn't been seen since February and the band members miss him, that's all we can tell you. I hope you are not going to trivialise all of this." Meanwhile back in Blackwood the manager of the local record shop says the sales of the band's latest album Holy Bible have been "disappointing, and have sold nowhere near what their first album did. But listen, we don't want to get involved in all of this." A copy of the new album sticks out on the shelves. A closer look at the printed lyrics of a song co-written by Richey, called This Is Yesterday, seems to sum up his present predicament. "Do not listen to a word I say. Just listen to what I can keep Silent. The only way to gain approval is by exploiting the very thing that cheapens me." This page was last modified on 15 May 2018, at 09:02.